As we enter this Season of Goodwill we bring you the next thrilling installment of our new Aerospace Collection. This Newbury variant (with slightly protruding rim) has a nice opaque veneer and whilst the print & logo are not the most inspiring, what I love about it is the one solitary droplet of beverage stain, magically stopped dead in it’s tracks just under the rim. When we are given/donated mugs to shoot we invariably give them a bit of a valet, removing obvious exterior staining and even chive remnants from larger vessels but this mug was shot on location – ‘Keepin’ it real’ – and it brings a very honest quality to this hard-working mug, which doubtless delivers drink-upon-satisfying-drink to it’s owner. 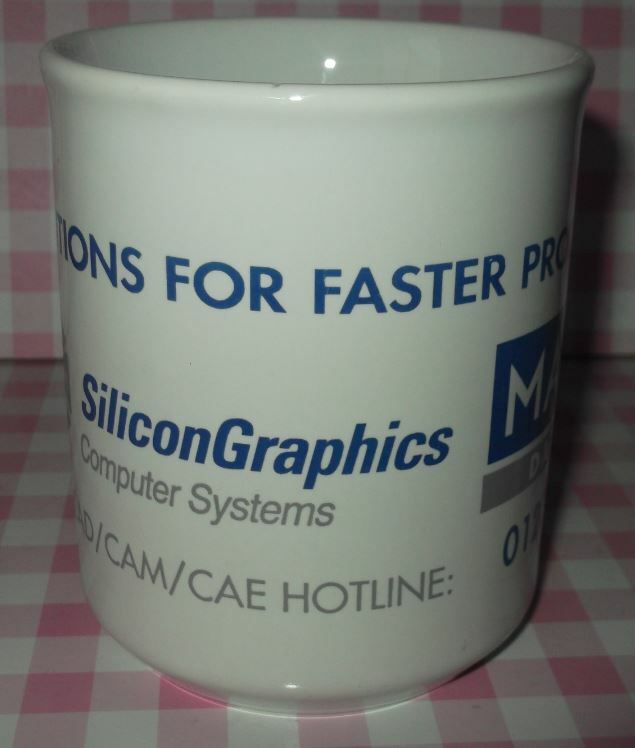 …and if we turn out an half-decent mug in the process, then that’s a bonus. Mugspotters is very proud to bring you Part One of our brand new “Aerospace” collection. You could not imagine my excitement as I opened an e-mail from a fellow Spotter this past weekend and caught sight of this photo as it peeled down the screen…. 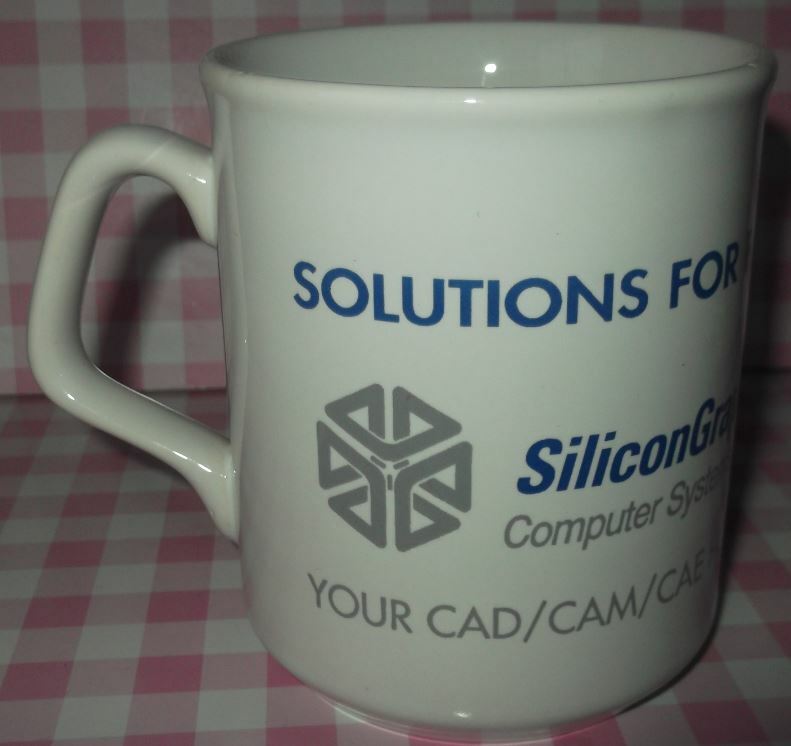 This is one mug-nificent Cambridge! We have only one elevation to present to you but it’s a stunner. It just looks & feels American. A cool bold logo adorns a gradated blue background, with a wonderfully over-exaggerated Screw-Rivet pulling in from the side. It’s strap line says it all: SST: Superior Sheet Take Up (whatever that is…) It’s doesn’t matter. It’s an exceptional piece and right into the Mugspotters Hall Of Fame. I am quite concerned however about the top part of the vessel as it looks to be displaying signs of “mug-patina”. The print has worn off the top outer rim, probably due to some heavy duty dishwashing and much supping, which is a shame but does signify that this is someone’s pride and joy and provided some heavy duty beverage service over the years. 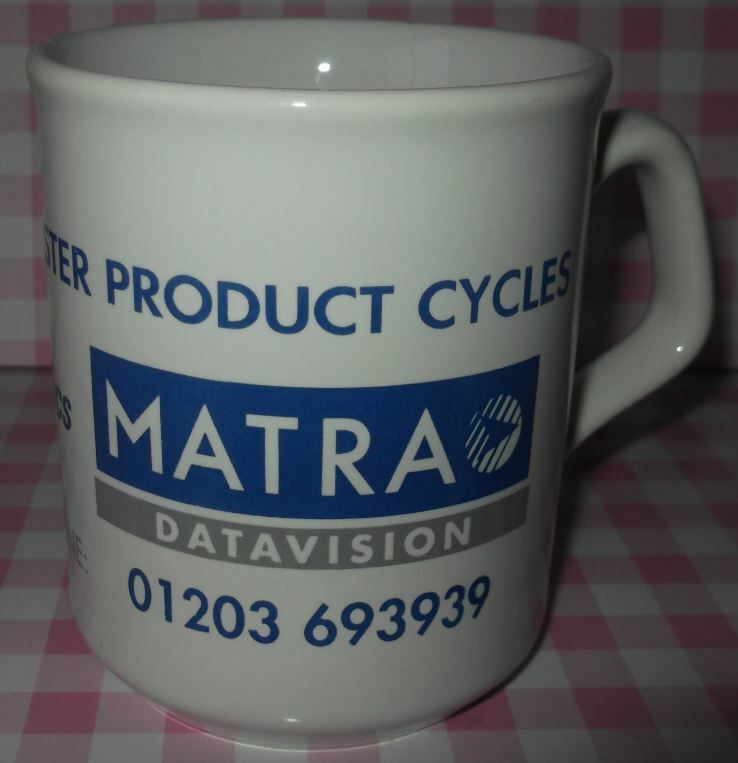 There’ll be no doubt though as to who this mug belongs to. They’ll be wondering through the office with a blue-tinged bottom-lip. 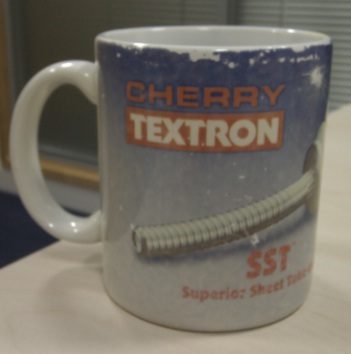 If you search Cherry Textron on the web, it’s reveals a fascinating story. Buckle up and let me enlighten you…. The Cherry Rivet Company was founded in Los Angeles in 1940. In 1952, the Cherry Rivet Company moved to Santa Ana, California. The company was purchased by Townsend in 1951 and then by Textron in 1959. In 1995, Textron Inc. also acquired Avdel, a UK-based fastener manufacturer. Fastening Systems, later known as Acument Global Technologies. And all the Mugspotters said..